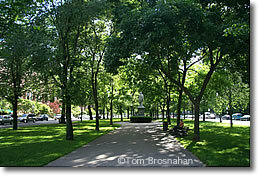 Boston's only boulevard in the grand European style, it is a beautiful link, through the Back Bay, in Frederick Law Olmsted's Emerald Necklace of Boston parks and gardens. Boston is a city of districts and neighborhoods, with few grand boulevards. The exception is the Back Bay district, which was a planned 19th-century development built on filled land. Commonwealth Avenue, a wide, tree-lined divided boulevard, is the main thoroughfare of Back Bay, an important link in Frederick Law Olmsted's Emerald Necklace of green spaces extending from Boston Common for miles to the Arnold Arboretum. Starting at the Public Garden, "Comm Ave" (as it's commonly called) extends southwestward for more than a mile, lined with grand townhouse mansions and studded with statues and benches. It ends at the Back Bay Fens, which extend the Emerald Necklace southward and westward toward Jamaica Plain. Commonwealth Avenue defines the most graceful residential area of the genteel 19th-century Back Bay. Beacon Street to the north, and Boylston Street to the south, are the other major east-west streets in Boston's Back Bay. The shorter north-south streets of Back Bay that cross Cmmonwealth Avenue have been named in alphabetical order. Thus if you go westward along Commonwealth Avenue from the Public Garden you'll cross Arlington, Berkeley, Clarendon, Dartmouth, Exeter, Fairfield, Gloucester and Hereford before the system dies and you come to Massachusetts Avenue.